« How to Add a Folder to Start Menu? Move over to the insert tab and you would see a number of options which you can add to your presentation. 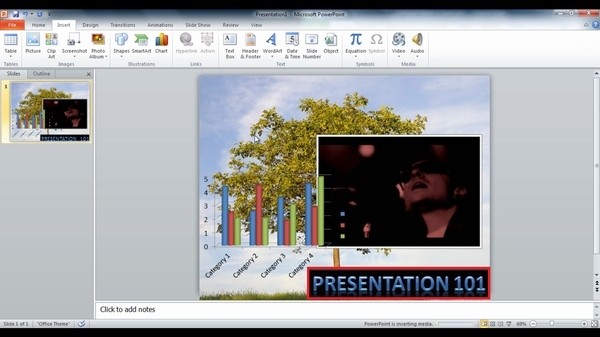 Adding a video file to your presentation is fairly easy. Click on the video icon and choose your file. You can drag around the video on the canvas and resize it. You can even trim the video by second clicking on the video and choosing the trim video option. 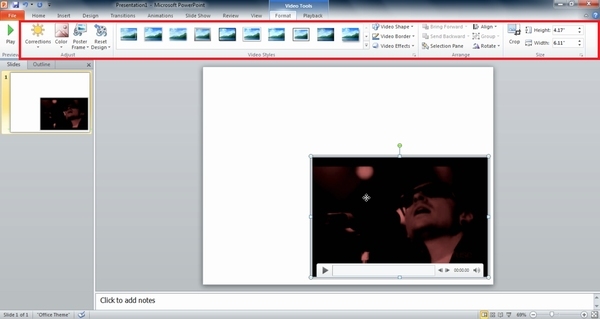 Move the cursors and select the part of the video you want to show in the presentation. You can even change the color of the video and play around with certain effects like the brightness to name a few. 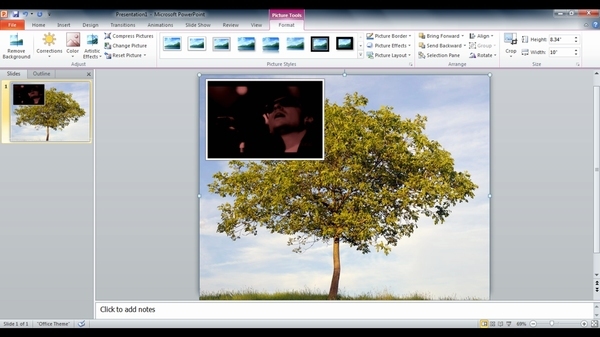 You can even choose to add a frame to your video. Now lets add an image in the presentation. Go to insert and click on the picture icon. choose an image that you want to add to the presentation. Once the image appears on the canvas, you would notice that it is overlapping the video. You can move the image to the background by second clicking on the image and choosing the send to back option. You can add various effects to the image for example frames, color correction etc. Now lets add a chart to our presentation. Again go to inset and click on the graph icon. There are number of different types of charts that you can add to the presentation for eg. pie charts or bar graphs. Just choose any that fit your needs and requirements. You can reside and move around the graph as required. 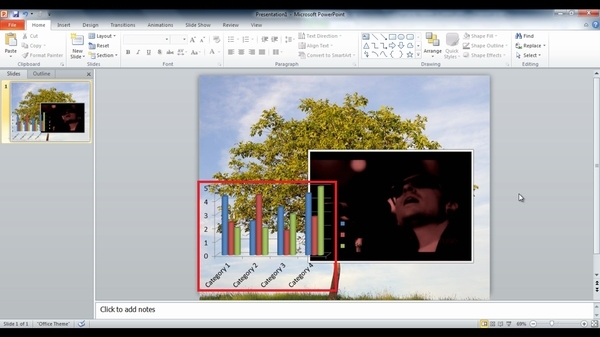 You can even overlap the graph on certain objects on the canvas to give a unique look to your presentation. Now lets add a little bit of word art in the presentation. You can choose from a number of different effects and once chosen, simply write your text and position it on the canvas. You can even give your text a background and 3d effects etc, to make it stand out. There are many other options that you can choose for your presentation for example adding an audio file to add a little bit of music to your presentation or making photo albums for that smooth transition. Adding objects to the canvas is just a click away. Just play around with the application a bit. You will get the hang of it sooner then you think.